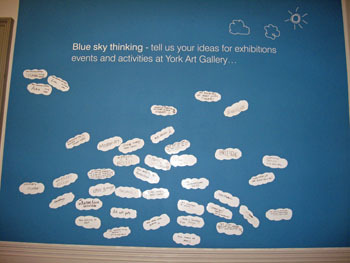 York Art Gallery wants our views on proposed improvements to the building. There’s an exhibition in the Little Gallery upstairs outlining the plans and asking for our ideas. It’s nicely done, and there are various ways of offering ideas or voting on preferences, as well as some interesting information displayed on the history of the building. More on this later perhaps. 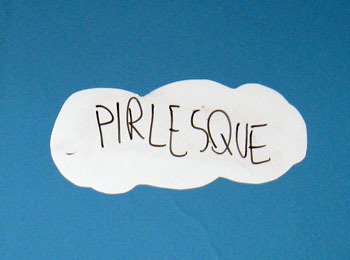 By the entrance to the room is a large board, with cloud-shaped notes, upon which visitors can write what they’d like to see in the gallery in the future. Ideas included the display of the Mona Lisa and Monet’s water lilies, an exhibition on the history of rock in England (as in music I assume, not geological,), more modern art, less modern art, ‘Whistler’s mother’, ‘handbags’, ‘less vases more pictures’, street art/graffiti, an exhibition of a girl called Mary naked, and ‘More pictures of dogs’.